Eilert Sundt must have had a busy, happy week. As the president of the Norwegian Cartozoological Society, Mr Sundt probably is the world’s most prominent ambassador of the obscure discipline of cartozoology (1). This unlikely cross-breed of cartography, zoology and urban planning got a huge boost last week, when the government of South Sudan announced plans to remodel its 10 state capitals in the shapes of animals and fruit. 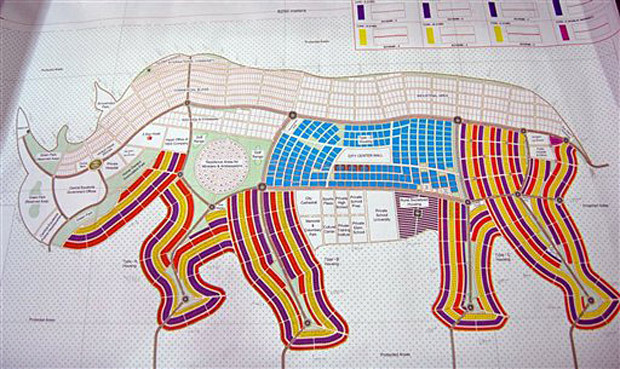 Under the proposal, the regional capital Juba would be laid out as a rhinoceros. Wau, capital of Bahr el-Ghazal state and South Sudan’s second city, is to be restyled as a giraffe. A third one would be transformed into a pineapple. The other state capitals would also be remodelled to look like the flora or fauna in their state emblems. “Finally, finally, the world is starting to see things my way,” Mr Sundt must have exulted. The cartozoologist obviously refers to the dire straits, financial and humanitarian, that South Sudan currently finds itself in. The zoomorphic (2) remodeling would cost just over $10 billion (and take about 20 years). South Sudan’s total annual budget is a mere $2 billion. South Sudan, christian, animist and black African, is still recovering from the 21-year civil war it fought with the Sudanese central government, which is Arab and muslim in outlook. The UN estimates that 9 out of 10 Southern Sudanese live on less than $1 a day. Hunger is common, paved roads are rare. A referendum next January is expected to result in independence, making South Sudan (3) not only the newest, but also one of the poorest nations on Earth. The levels of corruption are such that it is called, only half-jokingly, a pre-failed state. Much of that corruption, as well as the main hope for future progress, is based on the region’s oil wealth, providing 98% of the aforementioned national budget. So are the plans to transform Juba, the national capital in waiting, into Rhino City a crass example of money-wasting corruption (4)? Or are they a clever way to raise the profile of South Sudan enough to eventually attract visitors other than oilmen and aid workers? Despite Mr Sundt’s misgivings, the latter is not unthinkable. While not exactly cartozoological, the artifically modelled World and Palm Islands off the coast of Dubai have attracted heaps of media exposure (and investment, probably). South Sudan’s Rhino City, Giraffe Town, Pineappleville and other beastly burgs or plantlike polities might just exude enough appeal to attract a certain brand of curio-seeking traveller. A truer, if less well known example of cartozoology was discussed earlier on this blog: Ciudad Evita, an Argentine development shaped to look like Evita Peron’s profile (see #346). But yet another example posted earlier on Strange Maps shows one major downside of cartozoology - whether intentional or not. The president’s office in Juba would be placed in the rhino’s eye. The police HQ for Central Equatoria state would be at the rhino’s mouth. The rhino’s ear would house an entertainment park. An industrial area would be situated along the rhino’s back. The rhino’s four legs would be used for residential housing. In Wau, the giraffe’s backside would be the location of a sewage treatment plant. This image was taken here from Fast Company. Picture by Peter Muller/AP. Any additional images of the maps themselves would be greatly appreciated. (3) If that will be the name of the new state. It seems a waste of energy to wage a separatist struggle, merely to prefix a wind direction to the country you’re so determined to break away from. (4) South Sudan’s parliament still needs to approve the plans, but talks to develop the animal- and vegetal-shaped zonings are already under way with foreign construction firms.